With the amount of data companies have to manage increasing, scaling an Oracle database is an inevitability. Here is a look at some proven database scalability strategies. that allow a database to grow from one used by a small department to one more suitable for a giant multinational. The company offers a wide array of tools and techniques for database scaling, but it has always been the challenge of the IT manager to apply these tools at the proper times to ensure seamless growth, while keeping hardware investments to a minimum. Learn about scaling and reliability features of Oracle in this expert tip. Learn why eHarmony chose Oracle 10g for its scalability. Even though hardware prices fall by an order of magnitude every decade, the investment in computing resources remains a large, critical expense that requires careful management. Hardware depreciates regardless of use, so a too-much, too-soon approach can be wasteful. On the other hand, waiting until the system experiences stress-related response time delays is also bad, especially since today's end-user community has very little tolerance for sluggish response time. The overall goals for any IT manager are twofold: maximize end-user satisfaction while minimizing expenses. Monitor end-user satisfaction -- The primary objective of any information system is end-user happiness and, assuming that a user's data is correct and complete, the number one factor is response time. The IT manager must put in place end-user monitors and carefully ensure that end-user access speeds remain fast. Manage economic resources -- Hardware is expensive and an IT manager must devise a plan to add new hardware only when it is needed. Advanced planning with Oracle tool standards can also reduce the DBA costs involved in growth. Given these goals, there are several important tools and techniques that will come into play as you design a scalable architecture for an Oracle database. Enforce Standards -- Oracle has many standard conventions that facilitate seamless growth. This would include disk standards, like SAME (Stripe And Mirror Everywhere), which is Oracle's "RAID-10" standard for data file layouts on disk. Also, be sure to follow the Oracle Optimal Flexible Architecture (OFA) for all external files and directories. Following these standards will make it very easy to grow the database when the time comes. Perform Capacity planning -- Growth monitoring and planning are critical to seamless growth. Like any project, you must know exactly how long it takes to have resources added to your infrastructure and plan accordingly. For example, if it takes a vendor 72 hours to install more disks, your predictive monitoring must alert you more than 72 hours before you have a disk-full condition. A good IT manager will install capacity planning and monitoring tools that alert them well in advanced of any resource shortage. In a rapidly growing database, the idea is to fix the problem before it cripples the database and effects end-user response time. Don't skimp on resource quality -- When choosing a hardware vendor and DBA staff, don't look solely at cost. Top quality resources are expensive and a penny-wise, pound-foolish approach can backfire. For example, a DBA with 10 years experience who charges $300/hr is often a better value than a $75/hr DBA because they can work many times faster. With hardware, choosing from the top tier vendors such as HP, IBM, Sun Microsystems, is always a wise approach. You will pay more up front, but you should get what you pay for. Use the right tools for the job -- Because Oracle is the world's most flexible database there are many tools that do similar jobs. For example, high availability can be accomplished with Real Application Clusters (RAC), Oracle Streams, and Oracle Data Guard. The savvy IT manager will hire Oracle experts to advise them about the right tool to match their specific requirements. While this may seem self evident, we must remember that the stakes are high, and hundreds of millions of dollars are riding on an IT manager making the right decisions for any mission critical database. Hardware depreciates rapidly -- Hardware becomes worthless quickly, depreciating as a function of age, not a function of usage. All CPU's, disks, and RAM rapidly depreciate to worthless in just a few years, regardless of how much they are used. Today's servers allow for internal expansion -- Many companies offer servers that can accept additional RAM and CPU quickly, such that you can scale-up, within a single server environment. Human costs now exceed hardware costs -- With hardware costs falling rapidly, Oracle DBA costs will frequently exceed hardware costs. For example, instead of paying a DBA $200,000 to tune the I/O for a large database, you may choose to deploy solid-state disks for $100,000. Independent advisors are more reliable -- Obviously, hardware vendors will have a built-in bias, as will Oracle's consultants, each pushing their own hidden agendas. It's not hard to find experts with a proven track record of success in architecting scalable systems. Now that we see the basic concepts, let's examine a proven approach for scalability, the scale-up, scale-out approach to infinite growth. While Oracle has a host of tools that facilitate scalability (online reorganization tools), Oracle RAC is most commonly associated with scalable Oracle solutions. RAC is marketed for two purposes, scalability and continuous availability. While RAC is a superb 24 by 7 availability solution (when used in conjunction with other redundant components), using RAC for scalability is widely misunderstood. It's important to know that RAC only prevents outages that are due to an Oracle instance failure and a complete High Availability solution also requires redundant disks and other hardware components. Using the scale-up, scale-out approach, RAC only comes into the picture when you have saturated a single server. Let's take a closer look at how the scale-up, scale-out approach works. To achieve seamless growth, you need to be able to start with a server environment whereby additional computing resources can be added without service interruption. You must be able to add RAM, CPU's and disk as the workload grows. Eventually, you will saturate the capacity of even the largest single server, and then you start the scale-out process, adding additional servers to accommodate your growing workloads. Let's start by understand how scale-up (vertical integration) works with Oracle systems. Oracle hardware vendors promise on-demand computing resources, lower TCO, and easy scalability. Their huge servers offer savings from CPU and RAM consolidation, far less human management costs, and seamless allocation of resources. In the "scale-up" approach, server resources (CPU, RAM, Disk) can be added into a single, monolithic server, which can have slots for up to 64 CPU's and over 256 Gigabytes of RAM. Examples include the HP Superdome (64 CPU), the Unisys ES-7000 Series (32 Processors), the Sun Microsystems SunFire and the IBM X and Regatta class servers. On demand resource allocation by sharing CPU and RAM between many resources. Less maintenance and human resources required to manage fewer servers. Optimal utilization of RAM and CPU resources. High availability through fault tolerant components. The expense and management of RAC is not required. But we cannot "scale-up" forever, and as our processing demands grow, we need to look at the scale-out, the "horizontal" integration of many large servers in a RAC cluster environment. Grid vendors offer solutions where server blades can be added to Oracle as processing demand increases. While grid computing offers infinite scalability, no central point of failure, and the use of fast, cheap server blades, it does have the same in-the-box parallelism that is found within a monolithic server. Unlike the scale-up approach, Oracle 10g Grid computing is not automatic and requires additional costs, additional training, as well as sophisticated monitoring and management software. The "scale out" approach is designed for super large Oracle databases that support many thousands of concurrent users. Unless the system has a need to support more than 10,000 transactions per second, it is likely that the system will benefit more from a scale up approach. In the real world, savvy corporations combine vertical scalability and horizontal scalability. They start with a large vertical architecture server, adding resources as needed. 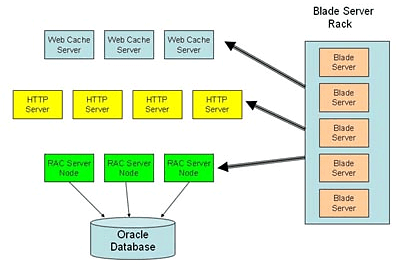 If continuous availability is also required, they may have a mirrored server using long-distance RAC or Oracle Streams. When the single server is approaching capacity, it is time to "scale-out" with horizontal scalability employing RAC and adding additional servers, each with a vertical scaling architecture. For these huge shops that rely on on-demand server allocation with Oracle Grid control, we see the ability to gen-in new servers on an as needed basis. The scale-up and scale-out approaches are simple in concept, but most difficult to deploy in practice. A common misconception is that everyone will need to eventually scale-out. However, in the real world, very few applications have workloads that saturate the capacity of the million dollar servers with CPU's and hundreds of gigabytes in RAM. The scale-out approach using RAC and grid control are designed for super large Oracle databases that support many thousands of concurrent users. Unless a system has a need to support more than 10,000 transactions per second, it is likely that the scale-up approach will be more than adequate. Amazon is an excellent example of a scale-out Oracle shop. Amazon announced plans to move their 14 trillion byte Oracle database to Oracle RAC on Linux and Amazon uses load-balanced Linux Web servers to horizontally scale its Web presence to millions of connected users. Remember, large-scale RAC databases use large servers, each with 32 or 64 processors and over a hundred gigabytes of RAM. As the capacities of the large servers are exceeded, a new server is generated into the RAC cluster.